Such a technical, thuggy and gymnastic climb! Really enjoyed ticking this one off my to do list! 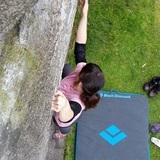 A really pumpy but fun problem! My favourite climb to date. Delicate feet and plenty of different ways to climb this route, a case of finding the one that suits you best! Really lovely problem, so happy to finally send it!